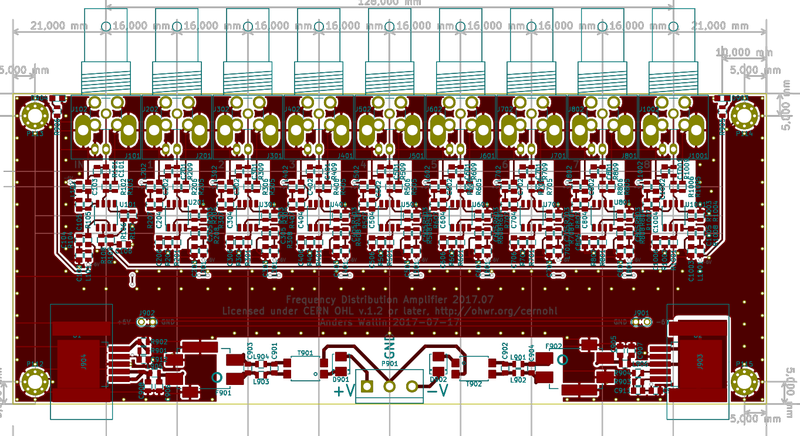 This page lists my Open Hardware electronics designs. Most newer designs have KiCad schematic, PCB-layout, and gerber-files available. Please ask if you are interested in the older designs - some may be available. 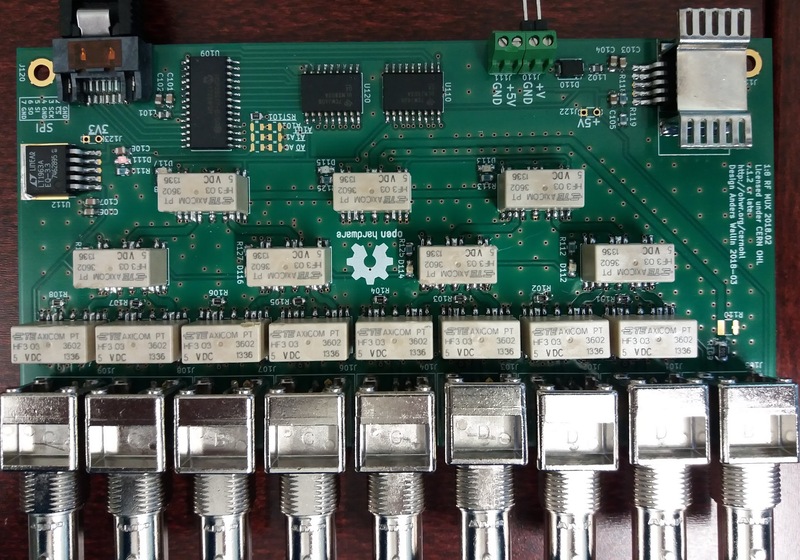 The fourth revision of a simple board for E/O and O/E conversion of RF signals using telecom SFP transcievers. 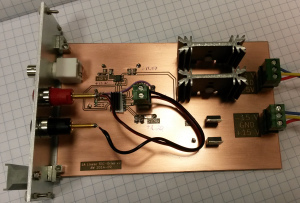 Works from 10 MHz (and probably much lower) up to at least 500 MHz. Standard SFPs go up to 1 Gbit (1.25 MHz) but this board will probably not work much over 500 MHz. One input, two identical outputs. Either SMA or BNC connectors. 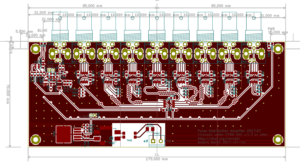 An update to the PICDIV frequency divider circuit. The input is a two-transistor sine-to-square circuit, taking 10MHz sinewave and turning it into a clock-signal for the PIC. The PIC has DIP-switches for selecting 1e7, 1e6, or 1e5 division, which produces 1Hz, 10Hz, or 1kHz output from a 10MHz input. 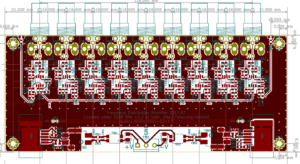 There are two outputs buffered by high-speed LVCMOS buffers - with trimmer-caps for adjusting output-skew. 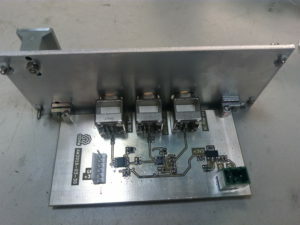 A 1:8 distribution amplifier for 1-10 MHz, based on LMH6702 and LMH6609 op-amps. Residual phase-noise of <-160dBc/Hz for a 10 MHz carrier. 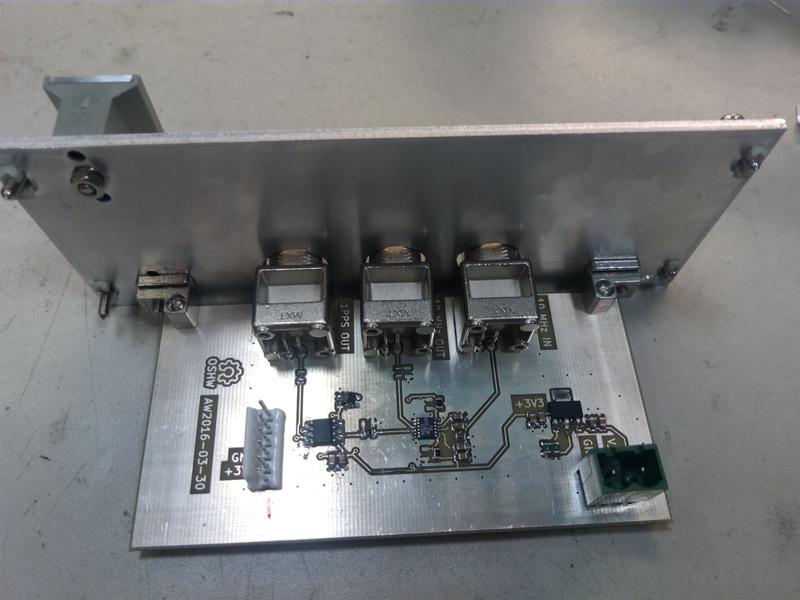 A 1:8 distribution amplifier for 1PPS signals, based on the IDT5PB1108 LVCMOS clock buffer. 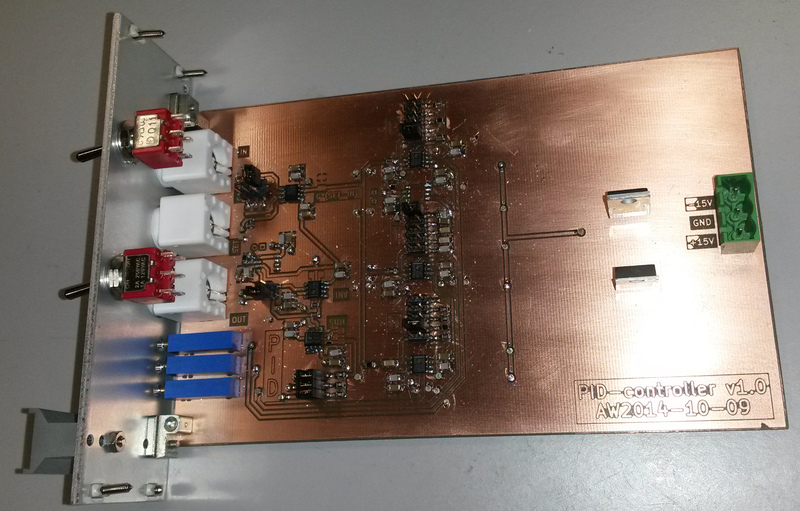 A 1:4 pulse-distribution amplifier for 1PPS with an optoisolator-input providing galvanic isolation. A 1:8 absorptive SP8T RF-multiplexer, with SPI interface. 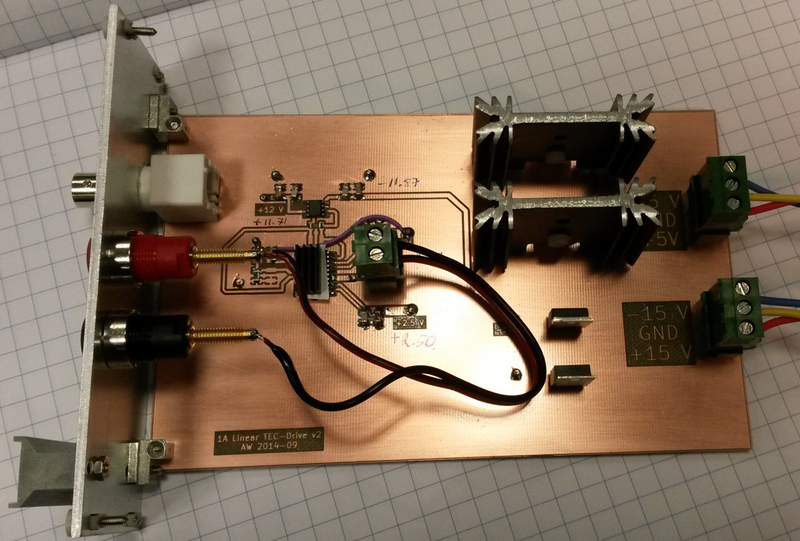 Based on TE HF3 relays. > 1 GHz bandwidth. The prototypes use an Arduino Due + Ethernet Shield for control. 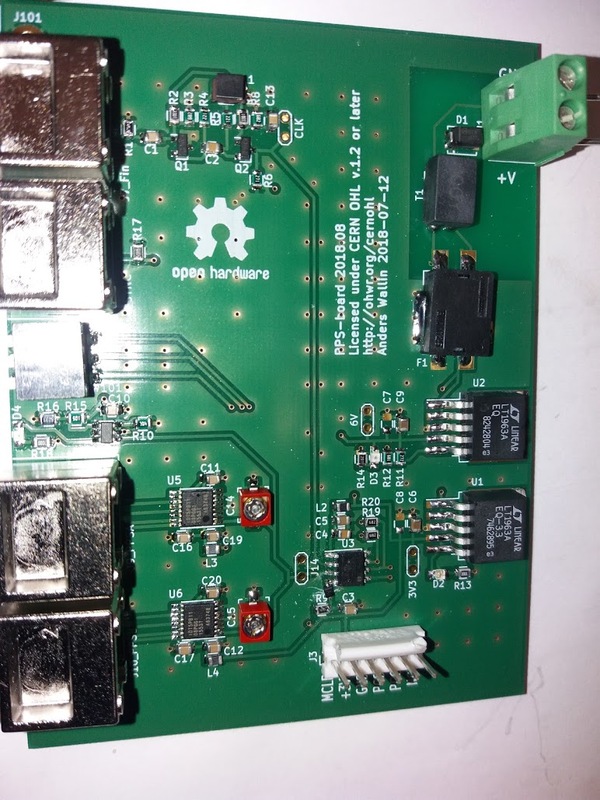 Simple Ethernet/LAN interface card for a HP/Keysight DSOX 2000/3000 oscilloscopes. 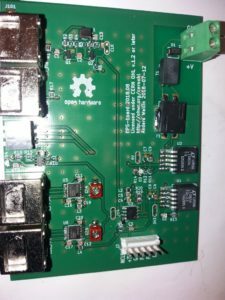 OPA569 based constant-current driver. 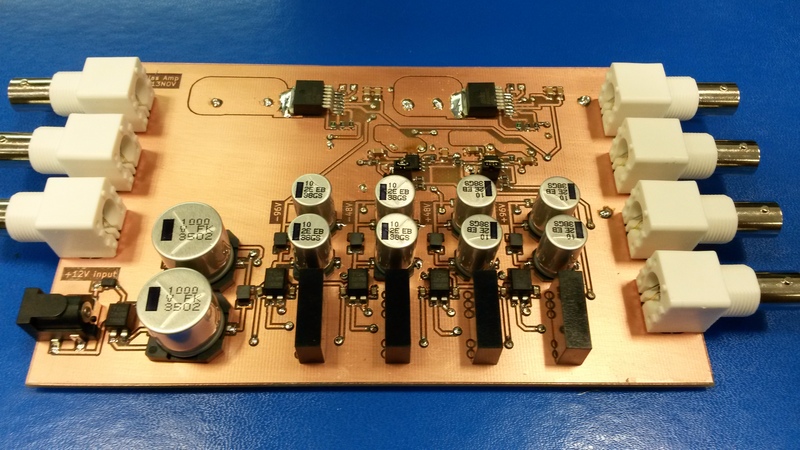 Drives +/-1 A constant current into a TEC based on a +/-10 V input voltage. 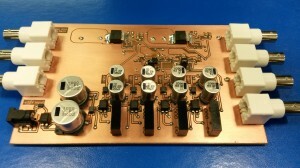 For providing +/-100 VDC bias-voltages to electrodes. 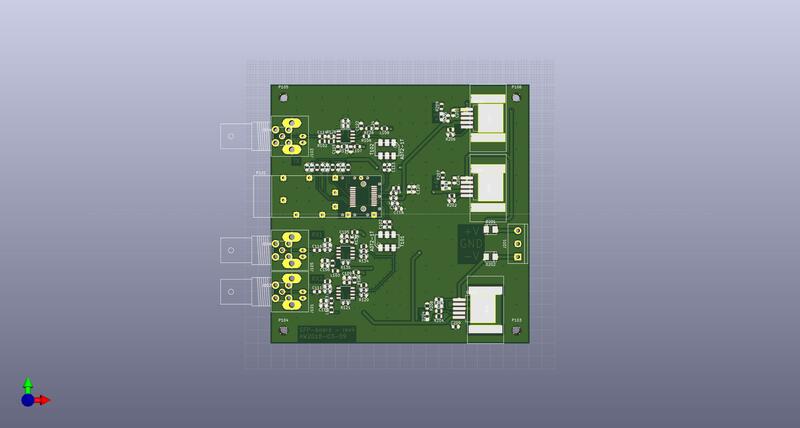 Based on Apex PA340 HV op-amp. 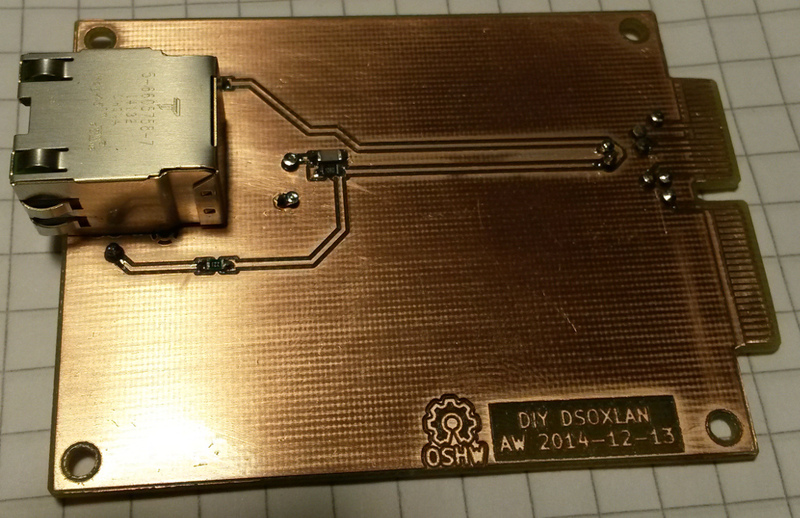 10MHz input, 1PPS output, based on Tom van Baak's picDIV code. Simple analog op-amp based PID-controller with jumpers for selecting P/I/D gains and trimmer-potentiometers for a weighted sum of P/I/D. These projects are not yet on this page. Pulse-stretcher (2014). 10ns or shorter pulse in, 100ns or longer pulse out. 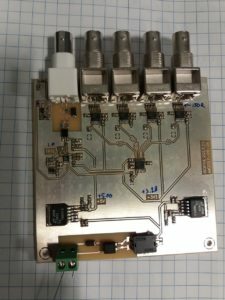 Agilent 34901A and 34907A breakout boards. 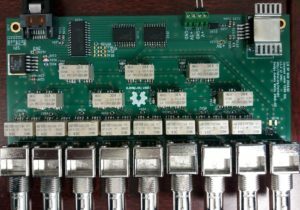 Breakout from 40-pin ribbon cable to BNC and D-sub connectors. Pt100 tempereature measurement frontend. 4-wire pt100 frontend driving constant current through the sensor and amplifying the voltage drop to +/-10V for a DMM-measurement.